Many of you have been asking how to find your way around the new VLE – here are some helpful tips. We’ve made the news much more obvious – remember to log in regularly to make sure you aren’t missing important announcements. You will see a box for each of the courses you are registered for. Alternatively you can – “See All Courses” – which will also be on the home page. The little red dots tell you what has recently changed or been updated on that course page. Check these to make sure you don’t miss out on important updates. Clicking on the red dot brings up a menu where you can see the changes and access them directly. Looking for the discussion forum? Or your messages from other students? Try the “Social media” button! Click on “Topics” to see the list of available resources for that course. Select the topic of your choice to access the relevant content, such as audio presentations (if available). You can access past exam papers by clicking on exams and then on “exam papers”. On the course home page you’ll find a description of the course, a word cloud of the common terms and some buttons which allow you to quickly access different parts of the course. You can easily change course by going to the drop down menu on the right hand side. We are continuing to make changes to improve the layout and navigation of the VLE. Feedback is welcome below. Is there any way to access previous years lectures/slideshows for each chapter of the subject guide? Even a few weeks ago the old audio lectures were accessible but now they aren’t, as material from 2013 is no longer accessible. Can these be found anywhere? These audio lectures where for the previous year and so are not relevant to the assessed syllabus for this year. As such giving access to them is a problem because it may be erroneous. Just wondering is there anyway to download the past exam papers and examiner’s report for years prior to 2009? I can’t seems to find them. I can only found the one from 2014 to 2009. Under the Law of Tort I had little red dots giving information on updates, and on 2 of the updates it gave a link to: Claire De Than – Defamation Part1: Claims, and Part 2. Unfortunately I was unable to finish the slidecast and thought that I could come back again to it. But I am now unable to find the little red dots and I can’t find the link to the slidecasts anymore. Would really appreciate if you could help make the information easier to access or include the red dots again. The red dots are changes since you last logged in, and are there to notify you of those changes. I think you need to update the missing information on the VLE site directly. The link is different, but it contains the same content as those that appeared in the dots. Those links are on the page provided, but without the slides. The original format isn’t mobile compatible and so we needed to convert it into one that was. You may also note we’ve moved from the page linked to before to a series of links on the tort page (see Additional Lectures). This is because we are now hosting the content on a much faster server to help people access it. Could you please tell me where I can find full version of recorded lectures, slides and downloadable files for all the topics in the syllabus for CLRI, Contract & Public? I only managed to find Criminal but even that the slides are not downloadable. Audio recordings are available for Contract and Public. If you go to the course page, click on “Topics” and the relevant chapter heading, the lectures can be found within each chapter. For CLRI, only the subject guide chapters and study pack readings are available under the “Topics” heading. Can you please demonstrate how I may find the audio-visual lectures for Tort on the new VLE, which I am finding extremely difficult to use. It is so NOT user-friendly!!! If you go to the Tort course page and then click on the “Topics” heading, you will be able to find the audio recordings within each chapter (where they are available). Currently, audio recordings are available for chapters 1-6. I am having problems acessing the vle and canot thensend my casenote it means that i will fail that part of the course. I need some one to please help me. Please log an enquiry through the student portal explaining the difficulties you’re having accessing the VLE. My colleagues in the technical team will fix this for you so you can upload your case note by the deadline. Can you pl provide a copy of the exam schedule? When will I be notified for exam? It’s been a long while. 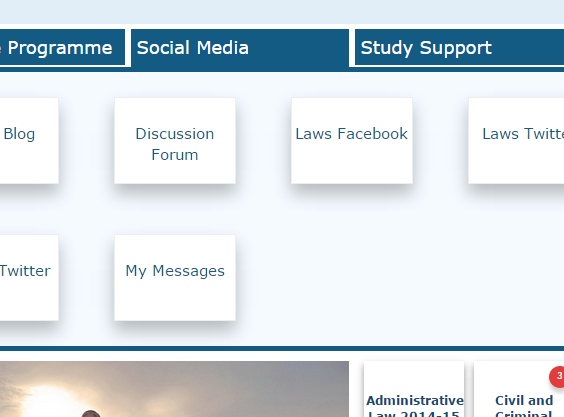 The previous VLE had a career section but I dont see it on the new VLE. Can you tell me where to find it? The new VLE is a bit difficult to navigate through. please how do I access my 2014/15 results? I passed the final year’s subject. How do I know I have been graduated from LLB? And when could I get the certificate?